After arriving in this world, Hua Huo always felt that something was wrong. When they had just landed, Red Lotus, White Lotus and Hua Huo had encountered the undead bone dragon, who was probably the most terrible monster in this world, and they had to fight against this annoying bone dragon. Finally, they got rid of the dragon and started to look for Yun Xi, but they could find no clue. They had found all the other Sword Palace disciples and still didn’t know where Yun Xi was. Not only that, after coming to this world, her “detection radar for rivals in love” kept warning her. It was an instinct learned from a protracted struggle in her past life and had never made a false alarm. Due to this, she could find the girls who wickedly tried to take away her Little Xi. However, isn’t the warning too frequent these days? From ringing several times in a day to ringing dozens of times in a day, till now it kept warning her nonstop, it seemed as if her “detection radar” had broken. Just like when she looked at the girls formed by mist, they all showed as red points on her “detection radar”, which meant that they were all her rivals in love. Even if my Little Xi became this world’s emperor and had a big harem, he wouldn’t have so many imperial concubines! Apart from this, when she looked at the two masked men in front of her, she felt distressed from the bottom of her heart. Why? Is it because the man on the left looks a bit like her Little Xi? No, he can’t be my Little Xi. That man looks much older than Yun Xi, and my Little Xi wouldn’t be so leisurely if he was surrounded by a group of beautiful girls. She could notice that these mist girls often looked at this man with a soft look. Even when they were fighting, they still often stole a glance at him, but this man didn’t notice this at all. Who is this dandy? What’s his relationship with these strange mist girls? They are not some creations simply made by magics. They all have their special characters! After realizing this, Hua Huo bellowed out to this miracle. In her heart, perhaps only the power of “god” could produce such an army. No wonder that Shaya Longnis, the Sky Sword cared for the Water God so very much. The Water God can’t be simple, perhaps it is much older and more mysterious than any of my guesses. However, it had nothing to do with Hua Huo. Hua Huo only cared about the red masked man who was standing beside the silver masked man. It’s strange. 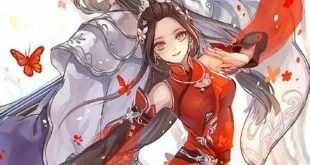 Hua Huo thought that she had never seen this red masked man before, but when she looked at him, she felt hostility toward him… no, it’s not just hostility. It’s anger! It’s an unexpected rage that is even beyond her understanding! On Hua Huo’s “detection radar”, this man’s red point was bigger than any of the mist girls. This man’s sense of existence was so strong that it even made Hua Huo’s eyes twitch. Hua Huo could feel the uneasiness in her heart. It was a warning from her bloodline. She probably had met the most terrible rival in her life. “No! I can’t take it any longer! Let me beat him down first!” Although there was no reason to explain her hostility, Hua Huo still decided to believe her instinct. If I can’t figure it out, let me beat him down first then think about it again! Hua Huo’s heavy sword churred, emitting a sound that could shake the heaven and the earth. Instantly, Hua Huo had locked onto Yun Que. For a moment, they gazed at each other. “You’re my enemy!” Hua Huo exclaimed her feelings with no disguise. “I will protect him!” For this world, even though Yun Que still thought that “Yun Hai” was a scumbag, she wouldn’t hesitate to protect him. “Take this!” Hua Huo held the heavy sword tightly, the heavy sword suddenly became blurred in her hands. “Forestall!” Yun Que drew the black longbow. This artifact named “Black Moon” immediately emitted a frightening aura. Compared to the time when she tried to assassinate Hua Huo, she had become much stronger, and her arrows was much more powerful and fatal. Sixteen blood lights of arrow formed from her fingers whens he drew the black longbow fully. The bowstring quivered, emitting an aura that wasn’t inferior to Hua Huo’s sword at all. In the Mist Soul Army, Yun Que’s Dark Elf Mist Soul suddenly raised her head and looked at Hua Huo. She suddenly disappeared in the air. For victory, I can become unscrupulous! From the beginning, she wasn’t planning to have a one on one fight. After all, she wasn’t a Saber but an Archer. Sixteen burning Spiral Arrows shot to Hua Huo from all directions. Even if you were the sun, I will shoot you down from the sky! Even if you were a star, I will break you up with my sword! Two girls, two different wills, but their minds were both unshakable. Yun Xi sighed after realizing this. How excellent are these two people! Even though their characters are different, they are similar in some sense. Sixteen explosions echoed between the sky and the earth. The fierce blast wave even caused a huge mushroom cloud in the air. The shock waves even spread to the sea, where was ten kilometres away. It was an impact between two hero ranked powers. It was a symphony of two strong souls. “Curse you!” Hua Huo heavily dropped from the sky to the battlefield like a meteorite, embracing her Sky Flying Bloodline’s absolute power.